Knitted Wire Mesh - Loos & Co., Inc.
Loos & Co., Inc.'s knitted wire mesh products, with a unique mixture of metallurgical and structural properties, offer high performance, customizable solutions in sealing, noise dampening, and filtration/process separation applications. 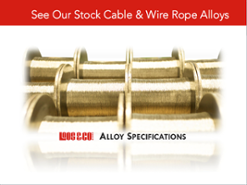 With over 50 years of experience in the wire manufacturing business, we've become experts in delivering products that are specific to every customer's exact requirements. Loos & Co., Inc. specializes in small quantity, high quality knitted wire mesh manufacturing runs which are beneficial to research and development efforts. We're experts in making products from specialty alloys that perform in high stress, critical situations, and provide quick turnarounds when needed at a reasonable price. Unique to us is our ability to produce specialty alloys in addition to the standard alloys which are widely available, and we keep Inconel® Monel® Aluminum in stock. Whatever your application, we have the knitted wire mesh product to meet your needs. Knitted wire mesh is a metal wire strand knitted into a mesh structure in very much the same way as sweaters. The process of knitting creates a mesh of interlocking loops, which move relative to each other without distorting the mesh. Learn more about knitted wire mesh. Because it is made of interlocking loops, it's extremely flexible and will return to its original shape when the stress is removed if not distorted beyond its yield point. Learn more about gaskets and seals. Like all of our other products, we're able to manufacture our knitted wire mesh in a variety of alloys in order to meet our customers' requirements. Some of these include 302, 303, 304, 305, 316, 321, 347, Copper Alloys, Hastelloy®, Inconel®, Monel® 400, and Aluminum. Bulk knitted wire mesh is often used as an insulation product. Due to its high-temperature resistance qualities, it is often used in applications that are prone to these conditions. 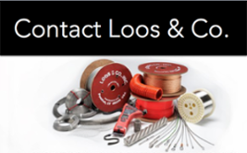 Because quality and performance matter, trust Loos & Co., Inc. to deliver the highest quality product specified to your needs. 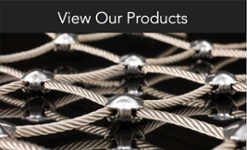 Contact us today to learn more about our knitted wire mesh products and get a custom quote.